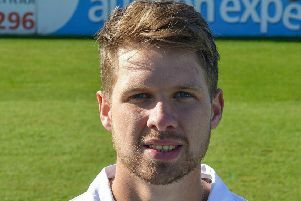 Matt Critchley, who took three key wickets in Derbyshire's victory. Captain Billy Godleman was delighted by Derbyshire’s flying start to the new Specsavers County Championship season this week. Speaking after his side had wrapped up a 125-run victory over Durham at Derby, Godleman said: “We had to work hard for it in the end but, across the four days, the bowlers stuck to their plans brilliantly. “At vital times in the game, with the bat, we were also able to make some substantial scores. The Second Division match actually began badly for Derbyshire, who were bowled out for 197 on the opening day. But the bowlers hit back to dismiss Durham for 171 before a second-innings total of 334 set the visitors an unlikely 361 to win. Durham moved to 177-4 but then collapsed to 235 all out, with Matt Critchley taking 3-54, including two wickets in as many balls, and new signing Logan van Beek weighing in with a couple of key wickets, as well as taking a stunning catch. Ravi Rampaul also bagged two scalps, and there were 18 overs remaining when Luis Reece clinched the win.